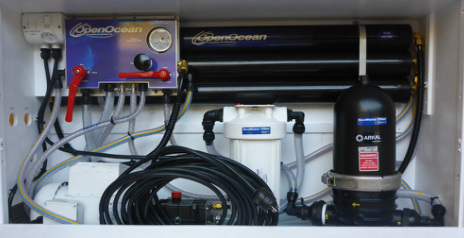 At Open Ocean Ltd we are happy to custom build your reverse osmosis watermaker to your specific needs. Open Ocean Water Makers has developed reverse osmosis systems in the Pacific Islands to allow resorts to continue to operate during their dry seasons. These systems are land based either portable or fully commissioned plant rooms. The Ipipiri, a luxury cruise ship in the Bay of Islands, has two of our 240 liter/hour systems on board for the convenience of their guests. They have now switched their toilet systems from sea water to freshwater eliminating stale sea water odors. Open Ocean Water makers are installed onboard both commercial and pleasure vessels operating in extreme areas such as the Arctic regions. These systems require special pre-filters to take care of excessive amounts of plankton and extreme operating temperatures. Open Ocean thinks outside the box and can design and build portable land based desalination units to meet any customer requirements. Have a look at its test run video. This unit was designed to provide the fresh water required to make concrete to build disaster relief shelters in the Pacific Islands. Open Ocean Water Makers has developed reverse osmosis systems in the Pacific Islands to allow resorts to continue to operate during their dry seasons. These systems are land based either portable or fully commissioned plant rooms. The New Zealand Children's Health & Education Trust have a custom system in Vanuatu. Our regular high pressure pumps deliver 15.9 litres per minute of water flow. For high volume projects we have large capacity high pressure pumps that move 28.8 to 45.4 litres per minute driven either by 3 phase AC motors or from a power take off on an engine. For our extra high-flow systems, we fit them with our new 4" (100mm) diameter membranes. These kinds of systems make a lot of water, very quickly. 345 litres per hour (8280 litres per day) and 600 litre per hour (14400 litre per day) systems are currently available. If your desalination needs don't aren't a good fit with one of our existing systems, let us know and we will engineer a system to meet your unique requirements.